This gem of a stole is made in jewel-tone colors of narrow lace strips that are joined as the panels are knitted, thus eliminating the need for any sewing later on. 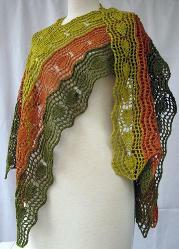 The undulating edges around the stole and between the strips add movement and interest to this eye-catching stole. Project Size: 50" by 22" with a split to give an effective length of 74"